The night before the night before the Adidas Grand Prix meet in New York I got to spend some time shooting the breeze with two of my favorite women. One was my wife Alice. Alice is the kind of person who, about eight years ago, decided she wanted to publish a book. Many of us pointed out that one does not just “decide to publish a book.” The book-publishing industry generally has something to say about whose books get published and whose don’t, and that industry had already entered the precipitous decline that continues to this day. Alice chose to ignore our sage advice, and within two years of declaring her intention, Simon and Schuster commissioned her to write a book. Which they then published. And her adventures with magical thinking continue. 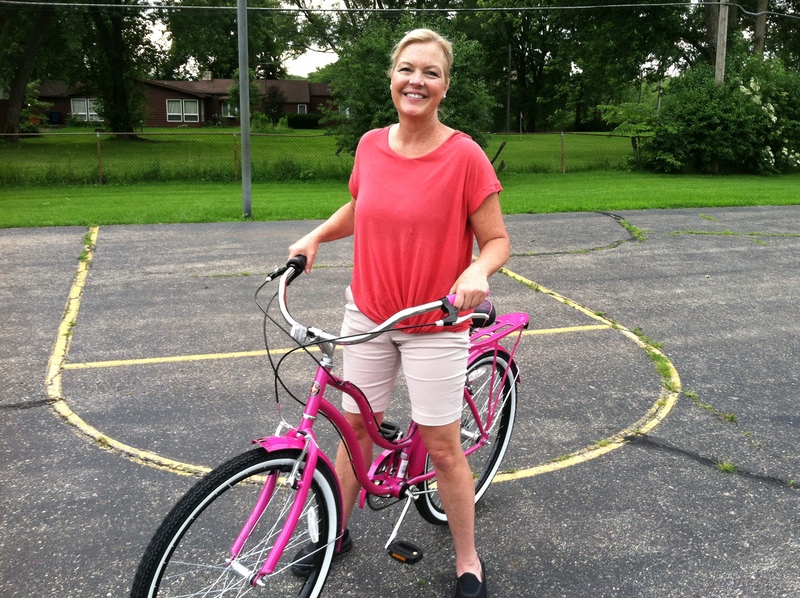 Today, Father’s Day, she ran out to the store ostensibly to purchase a grill (a good, manly Father’s Day gift if there ever was one) and instead returned home with a magenta-colored bicycle. For herself. She figured that it would make me happy to see her happily pedaling around on that bike, and once again she was correct. 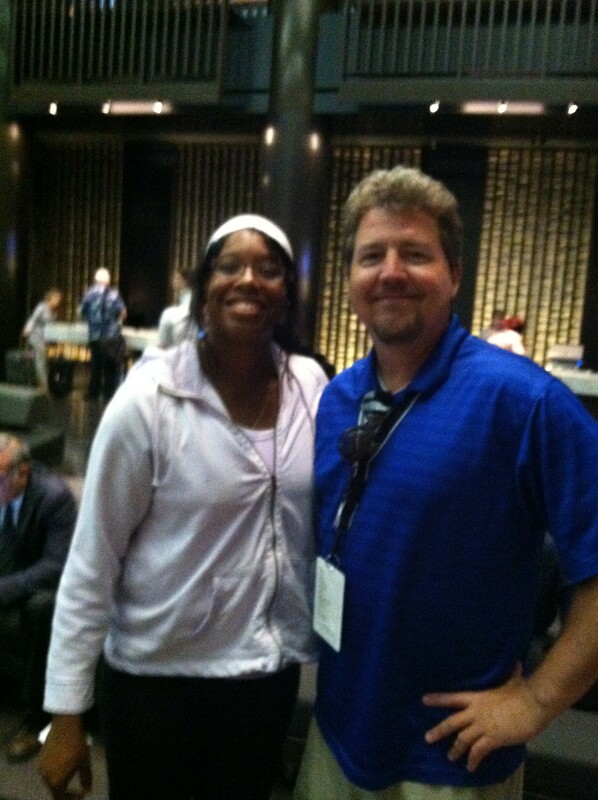 The other person I got to shoot the breeze with was the fine American discus thrower Gia Lewis-Smallwood. Gia is as friendly a person as you will ever meet, and like my wife an ardent practitioner of magical thinking. As evidence, I will offer up Gia’s year-by-year progression as listed on her IAAF profile page. 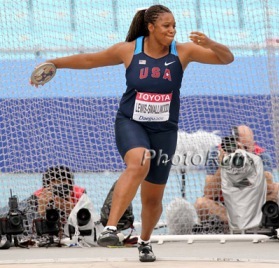 Gia graduated from the University of Illinois in 2001 with a PB of 57.76m. Eight years and three coaches later, she finally broke 60 meters for the first time. Compare that with Sandra Perkovic who became Olympic champion (with a throw of 69.11m at the London Games) a few weeks after her twenty-second birthday. By the age of 33, Gia had bumped her PB up to a respectable 63.97m, but that throw came in Hawaii and hardly served as an indicator that she was ready to compete with the big gals in the big stadiums in Europe–which is what you have to do to be considered a legit world-class thrower. Bottom line, approaching her mid-thirties, Gia had no concrete evidence that delaying entry into the “real world” in order to continue as a full-time thrower was in any way a good idea. But continue she did, and in September of 2013 she threw 66.29m to hand Perkovic her only defeat of the season. Then, last August, Gia made me look like I sort of knew what I was talking about when she obliterated the American record not on the wind-swept coasts of California or Hawaii, but in a stadium in France. Her throw of 69.17m established her as a legitimate threat to medal in Beijing and Rio. Take that, oh ye of little faith! Every once in a while I snuck in a question about throwing. Gia’s best performance of the year so far was a 62.99m toss in Rome, and she explained that an infection in the index finger of her right hand (a very important appendage to a right-handed discus thrower) had limited her training earlier in the season, but that the finger was feeling much better and she was confident that she would soon regain her top form. My wife actually asked an interesting question regarding throwing. Which thrower did Gia most admire? It terms of straight up awesomeness, the answer was Virgilius Alekna, the two-time Olympic gold medalist from Lithuania. But Gia also has great affection for the Estonian thrower Gerd Kanter, the gold medalist at the Beijing games. Kanter, it turns out, is a humble guy and very generous in sharing the many lessons he has learned over his long career. A piece of advice that stuck with Gia was that the prelim rounds in major competitions can be harder than the finals, and that she shouldn’t lose confidence if she doesn’t get off a big throw in the prelims. Just get through the qualification rounds and you’ll be able to relax in the finals. That is advice that Gia hopes to put to good use this August in Beijing. That’s Gia on the left. I think the guy might be Brad Pitt.